When boys reach that pre-teen age they can be difficult to buy gifts for as they float between child and young adult. This list of toys for 11 year old boys will inspire you with some gifts that will leave their mouths gaping in wonder and excitement at these cool items. Scooters are cool, but the Razor PowerWing DLX is on another level; if you are hunting for the most exhilarating gift for the child that you know and love, pick one up for them now. With 2 rear caster wheels, this 2 wheeler is perfect for drifting, spinning, sideways fun. In need of a new board game? Excellent, because none are quite as magical as this one. Inspired by the wizarding world of Harry Potter, This CODENAMES game turns players into members of the Order of the Phoenix in search of other agents amongst a series of references, whilst avoiding Death Eaters. There is no place scarier (yet somehow cooler) than Darth Vader’s castle. This evil Sith Lord is here in mini figure form along with other characters and equipment from the Dark Side. Kids can build his castle in great detail thanks to this LEGO set and have their very own adventures in the Galaxy. Boxing is a brilliant sport and a great way to stay fit. If your little one has taken an interest in this awesome pastime, check out this cool boxing set. With an inflatable punching ball (with pump), and a pair of boxing gloves, they can keep active whilst having a ton of fun. Ahh, the Xbox…what a machine. If your child has both access to an Xbox and the internet, send them one of these $25 dollar gift cards. Whether they want to rent a movie or buy a new game, they can do so by entering the code on the back of the card and downloading whatever they desire. Strategy games are a lot of fun, they help to exercise the brain and the smile muscles. Grab a copy of this cheese quest game that pitches users against each other in the fast paced quest to bring home the cheese! Just watch out for cats, traps and dead ends as you go. There is no 11 year old alive that would not want to receive a robot this Christmas. If you think that this is unachievable, you are wrong…simply check this guy out. 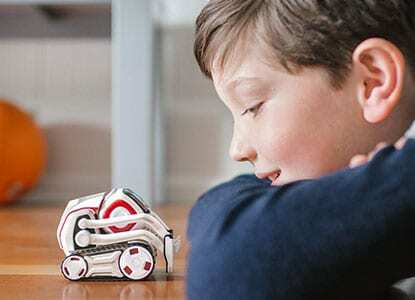 The Anki Cozmo is the robot that your child needs; with an unbeatable list of abilities, it needs to be seen to be believed. Does your little one want a pet of their very own? Great, then get them a Tamagotchi. This classic and much loved electronic pet has been around since the 90’s and will definitely give your kid a ton of caring fun. Watch as the Tamagotchi grows into an adult through the care that they receive. If they have taken an interest in technology from a young age, this is the kit for them. The Makey Makey kit is the set that they need to literally turn ordinary, everyday stuff into touchpads. Allow them to control and play games using just about anything; what’s the wackiest thing you can think of? Welcome to the age of the drone. These flying machines are just about everywhere; it’s no secret as to why, though – they are awesome! This kid friendly quadcopter drone is small in size and the perfect way for your child to start flying – its crash resistant design and stunt ability makes it cooler than cool. Do you know of a kid that has their own Roblox collection? If they are looking to expand it, this is they way to do so. Straight from series 3, this mystery selection contains 6 random action figures that will help their collection grow and strengthen. Monopoly is one of the most popular and best selling games in the entire world…however, so is Fortnite. Put the 2 together and you have something that is going to make your 11 year old child extremely happy this Christmas. The awesome Monopoly: Fortnite edition is available to buy right now. LEGO has been around for many, many years and is committed to helping children stay constructive. If you would like to get a set that will encourage your kid to learn all about robots, this is the set for them. With multiple robots to build and play with, they have tons of fun ahead of them. If the child that you know and love is a big fan of being outdoors, invest in a pair of these inline skates. Brilliant for their balance and general health, these skates have been developed by the ever popular brand: Mongoose, and have been designed for premium comfort and performance. Wow, how incredible is this? Link the cube to your smartphone and download exciting apps that will turn the cube into a hologram! Children will be amazed to discover that they can hold a hologram in their very own hand whilst looking through a phone. With tons of apps to download, the fun will last forever. This blog will show you how to create a clever triangle frame with ease which can be used to house your favorite photographs. With handy demonstrative photographs and concise and simple instructions, you’ll be creating your own frame, for gifting or for your own use, in no time at all. For a cool decorative idea for any bedroom, check out this clever blog post that uses ping-pong balls to make a string of fun and decorative lights. Follow the simple instructions and photographs in the blog and you’ll be hanging your lights in no time at all. For a gift with a difference, check out this blog post that will help you produce a pot of paper flowers and lollipops. With simple instructions and clever visuals to help you understand the creation process, this gift will be a winner with any child who receives it. Trying to think of what to buy for the 11 year old in your life? Why not make them something instead? The following DIY article will show you the information needed to make an entirely homemade hammock chair that can be hung in their very own bedroom. Fortnite really has taken over the world. If you know a child who is absolutely obsessed with this great game, it would make sense to throw them a themed birthday party, but if you are a little stuck, follow the link and you will find all of the inspiration you could ever need. Old t shirts do not have to go in the trash when they have been outgrown. Instead, consider putting them to good use and turning them into a wonderful pillow that can be given as a gift. A fun sewing project that can be completed by you alone, or with your child. Studies have proven that weighted blankets have a brilliant effect on calming nerves, relieving anxieties, and in general, being relaxing. With that in mind, you should consider reading through the following article and finding out how you can make one in your very own home for your child. Sharks are awesome, period. This absolutely hilarious hat can be made at home and will provide the shark loving little one in your life with a lot of laughs. Designed to look like the wearer’s head is being eaten alive, this hat is easy to make and a ton of fun. Give gifts for 11 year olds that they will actually use from stylish swim suits to super-practical socks. There is something here for every child whether they need some cool running shoes or a great umbrella. Stuck for ideas when looking for toys for 11 year olds with a difference? Check out this list of toys for kids to keep them active, whether they’re playing games outdoors or getting out and about with more freedom. Check out this list of ride on toys for 11 year olds which highlights good value – larger toys that your kids will want to take out time and time again. Don’t be in doubt over these larger purchases. Books for 11 years olds going through puberty offer a wide range of practical advice, skill building, and problem solving strategies. Check out this list to find something for every tween.